Herat (Persian/Pashto: هرات) is one the 34 provinces of Afghanistan. It is in the south-western region of the country. The main city and capital is named Herat. 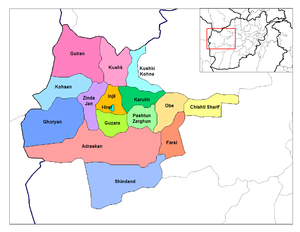 The region of Herat used to be part of Greater Khorasan. It was ruled by the Tahirids followed by the Saffarids, Samanids, Ghaznavids, Ghurids, Ilkhanates, Timurids, and Saffavids. In the early-18th century it became part of the Afghan Hotaki dynasty followed by the Durrani Empire. There are about 1,762,157 people living in Herat Province. There are 16 districts within the province. These are listed in the table below. Football (soccer) is the popular sport in Herat Province. Cricket is also getting popular. ↑ 1.0 1.1 1.2 "B. Demography and Population" (PDF). United Nations Assistance Mission in Afghanistan and Afghanistan Statistical Yearbook 2006, Central Statistics Office. Afghanistan's Ministry of Rural Rehabilitation and Development. Retrieved 2011-01-12. This page was last changed on 11 December 2017, at 02:45.